« The Ultimate Best Racket! I’ve heard a number of ridiculous rules brought about by recreational players that are just silly. I’ll try to dispel some of these myths and give a short-list of the essential rules you need to know when serving. If you can follow the rules outlined here, this should prevent 99% of the conflicts that often arise from not following rules. Myth #1: In a singles match, you have to serve diagonally (like in doubles). In Doubles, you’re required to serve from the right half of your side to the opposite side in the opponent’s half (diagonally). But this rule doesn’t apply at all in Singles. You’re free to serve anywhere, diagonally or straight, from any location. Myth #2: When you serve, the ball cannot fall off the side of the table. It must bounce twice or fall off the far end. When you serve, the ball is allowed to go anywhere, whether double-bouncing on the table, going off the end, or going off the sides. There’s no restriction on location as long as it hits both sides of the table. Update: Apparently this myth comes from the rules regarding players in wheelchairs but has been mistakenly applied to standing players. It’s there to prevent serves from going out of reach while seated. Myth #3: After you toss the ball, you can catch the ball and re-serve. This isn’t normal tennis. Once you toss the ball, the ball is in play and you cannot decide that you don’t like your toss and re-do it. Just make the best of it and complete the serve! A lot of players players don’t get the required height from their toss and will either hit the ball right out of their hand or do a quick drop-and-hit. This creates an unfair advantage because it takes more skill and focus to control a ball on a higher toss than a drop-and-hit where the ball is practically stationary in the air. It’s common to see players throwing the ball backward (away from the table) to help generate more underspin, but try to avoid this practice. Your toss should be mainly vertical, with very little horizontal movement in any direction. It’s somewhat problematic that the rule is vague as it doesn’t give a definition of how straight your toss must be. Can you toss it at a 45° angle? Is that vertical enough? Referees will use their own discretion, but try not to dance on the fine line. My own tosses are generally about 15° from the vertical. You can’t hit the ball as it’s on the rise from your toss, it must have started falling before you make contact. It doesn’t have to drop all the way down to the point where you tossed it, but it has to be falling. So if you tossed it 20cm high, you can hit it when it drops even 1cm from the top of the toss. Some players will either start the toss with the ball already inside the table, or will strike the ball while the ball is over the table, which is illegal. Also, the ball height must always be above the table surface, so you can’t wind up your super-high toss by starting the toss below the table surface. According to the old rules, you could leave your free arm in front to obscure the view of the receiver so they can’t see what serve you’re doing, but that has changed. Now you must remove your free arm (and body) so that the receiver has full view of the ball throughout the entire serve process. If you can just follow these rules, you should be able to avoid any fisticuffs and expletives at your next tournament. If you’re very thorough you can have a look at the ITTF rule book, but it’s a pretty dry read, so you would do fine by just following this post. Or just check out the service rules. And if you want to improve your serves, check out the Serves section in the Coach Wiki, or the Serve Training Videos section. Have you ever had a bad encounter due to opponents breaking the rules? Yes in my office every body is doing wrong services and I have bad encounter with them. 2.09.01.05.03 in singles leaves the receiver’s court after touching it by either of its sidelines. The wording is a little strange here. I read this as if your serve touches the receiver’s court and then exits the receivers court by the sideline, the serve is a let. So, the only 2 ways to get around this is to have the ball exit the baseline or bounce twice. I know the rules are being updated regularly, so maybe this is new since you wrote this. And yes, it’s also very awkwardly worded. Very true, thanks for the clarification. I failed to look at the numbering and thought all lines in the Let Section applied to any serve. I would like some clarification on the serve. The ball is allowed to exit the table on the end or either side; however, if (on the serve) it hits the 2cm white and then goes off the side is it fair? I read that it is a let if it happens in that way. This rule is specifically for players in wheelchairs. Hi am just wondering if u can answer me a small question, where r u supposed to stand when u serve? Or more specificly where rnt u allowed to stand when u serve? Do u have to Stand in the middle between the sidelines or can u serve from the outside of the sidelines? It’s not where YOU stand, it’s the position of the ball. I believe the ball must be behind the end line, between the sidelines, and above the height of the table. In table tennis you can serve from the left edge, right edge or behind the backline. You can not serve anywhere from the side of the table left of right. If you are right handed and have your left foot first you want to make sure when serving from the edge all of your right foot is behind the backline and your left foot being to your backline. You can stand anywhere behind the backline, left corner, right corner but serving from the side is illegal even though the ball may still be thrown from behind the backline. Arthur the ball must be behind the end line I am not sure what you mean though between the side lines. You can serve in any angle. In singles you don’t have to serve into a certain box that only applies with the doubles rules. You can serve from the right box into your opponents left or right box or more towards the middle of their side if you like. Its up to you what corner or side you serve from and where you want the ball to land has long has the serve is held in your hand for your opponent to see and is thrown vertical for your opponent to see and the ball is behind your backline then it is okay. The serve mainly must be held in your hand, thrown up and you can’t serve until the ball has fallen. The ball must be visible for you opponent at all times on the serve. I hope all this now makes sense. By “side lines”, I’m referring to the lines that run along the side of the table (the long edge of the table). So if you extend those lines further, off the table, I think the ball must still be between the two side lines (but behind the end line of the table, not over top of the table). So the ball cannot be left of the left edge of the table, or right of the right edge of the table. That’s the part I’m not sure of, whether the side lines matter. The only stipulation for where the ball must be during service is behind the end line and in full view of your opponent and the umpire. You can hold the ball at the left or right side barrier and serve from there if you wish, as long as the ball is behind the end line (this includes the infinite extension of the end line). There is also no rule about where a player must be positioned. You can stand with your back to your opponent and stretch your arms back behind the end line and serve if you wish. My friend was saying that when you hold the ball before the toss, your hand should be flat, so the ball is shown. Is this true? I will find it hard to toss a ball with a flat hand! Yes it’s true. But you can still make a “slight” cup in your hand by raising your fingers by 20 degrees so the ball comfortably rests in one spot, not rolling around on a perfectly flat hand. Just don’t curl your fingers up and cover the ball. You’ll get used to it after a while. You’ll also need a more controlled toss to prevent the ball from rolling mid-toss. When preparing to serve, I know that you must not obscure the ball from your opponent. Does the umpire need to be able to see the ball at all times before you serve? That I’m not totally sure of. If the umpire is on the side facing your back, then it’s impossible, so ‘no’. On your front side, I’m not sure how you’d be able to hide it from the umpire. No, once you’ve released the ball, there’s no taking it back. The play has begun. So no matter how bad your toss is, you have to make the best of it! Going back to service: a) is it a let if the ball bounces once and goes off side (or not end line) of opponent? b) is it a let -or a point- if it bounces twice on opponents side? I’m not sure I get the first situation (a). If you serve, and the ball bounces on your side, then on the opponent’s side, and goes off the side of the table, then it’s the server’s point. This is essentially referring to Myth #2 in the post. There’s no rule saying that the ball shouldn’t go off the side. For (b), if the ball lands on the opponent’s side and bounces twice, the server gets the point. Again, there’s no restriction on where the ball must go, except that it must first hit the server’s side, then the receiver’s side. It’s all fair game. If you watch the pro matches, you’ll see a lot of low, short serves that would double-bounce on the receiver’s side. And you would see some that would fall off the side after the first bounce on the receiver’s side. Its a let if it hits your side of the table, hits the net then goes over to the other side of the table. Number 4 states that the whole serve must be behind the line, but I see many pros hold the ball over the table when preparing to serve. Presumably they toss the ball backwards, which is illegal, right? When I watch the pros, I rarely see the *ball* starting over the table. 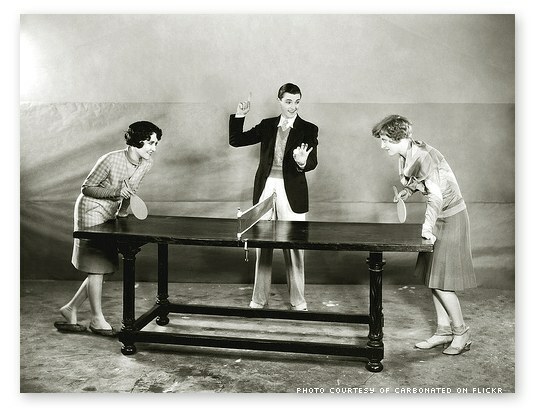 I often see them hang their *arm* over the table, but the ball is just off the end of the table, so it’s legal. I’ve only seen one or two pros start the ball over the table. But again, tossing backwards is legal depending on the angle. If the angle is too far backwards, the umpire might call it. But most pro players on a forehand serve toss the ball around 15 degrees backward (measuring from the release point to the top of the height of the toss. 45 degrees backward would likely get called by the umpire. A serve is a let if it touches the net but still bounces in the opponent’s area. The edge counts as part of the “top” of the table, so it is a live ball. It’s not “unplayable”, it’s just very “difficult” to play. Can our racket cross the sideline during service!??? Yep, your racket can go anywhere; it’s the position of the ball that matters. What is the protocol when an opponent isn’t really throwing the ball up 16cm but rather only throws it a few cm but started with their hand high and dropped their hand down quickly so that at a casual glance it appears the ball was thrown high enough. Is this considered acceptable or should it be challenged? I watch my son play a lot of local league matches where this happens an awful lot but no umpire yet has bothered to pick up on it. Well technically, the height of 16cm only counts once the ball leaves their hands, so your son can politely tell both the umpire and his opponent that the toss isn’t high enough. But it should be your son who asks him, not yourself. Parents calling out fouls from the sidelines usually just raises tensions and creates conflict. So between games, you can remind your son to talk to the umpire and the player. But if the umpire doesn’t call it, then there’s probably nothing you can do. Is the umpire a trained umpire, or simply another player in the round robin group and all the players rotate being the umpire for the other players? Thanks. That’s really useful information. I do keep my mouth shut as I know parental interference is not a good thing! He’s a kid playing in an adult league where the standard of serving is appalling. I asked an opposing team captain about it recently and he said he believes there’s a gentlemans agreement to not take any notice of the ‘new’ service rules which I know is untrue but it’s not easy to get it sorted. Sometimes my son looks more like he’s a goalie in a penalty shoot out than playing TT! Most blatant infringements are now being dealt with but the one I asked about is one that seems to be lingering and one that is not properly understood so your clarification will help a lot. As far as calling illegal serves, I only call it if I think it’s actually creating an advantage. The classic example is the toss that barely goes up 2cm, and the player strikes it at the top of the toss (essentially able to hit a stationary ball and impart lots of spin), which would be much harder to do if it was a 16cm toss. In those cases I call it. But there are infractions that are minor that really don’t create a benefit, such as cupping the ball with the hand instead of having an open palm at the start of the toss, so I just let those slide. No point creating all this conflict when it doesn’t even impact the result of the game, though official umpires may call them (and often do). Based on your description of the offense, I’m not totally clear whether it’s creating an advantage. I have a question about serves. If after you serve the ball it hits the end of the table on the server’s side and goes straight back, is it a let or the opponents point? It would be a point for the receiver. It depends whether you’re saying it’s an “edge ball” (which counts) or hits only the side of the table (out). As with all edge balls, the ball is still playable as if it hit the top of the table. And if it hits only the side of the table then it counts as “out” and the receiver gets the point. This case is never a let. It’s a point for the server. I can’t think of any way that a serve could hit the vertical side of the table, below the edge – unless you were playing outside: you serve, the ball goes over the net, over the side, there’s a gust of wind, and the ball blows back, but hits the table below the edge – then it WOULD be a foul serve; but how likely is that? Other shots could be hit from wide of the table, and thus hit the edge or below. generally, if they go down, they are out – but even referees find it hard to get these right in every case! Actually, a sidespin serve can hit the side and be out since it can curve past the side edge of the table and curve back in. You can serve to the opponent’s edges (either on the end of the table or either side), and you would win the point. But if you serve to his “side” (lower than the edge), your opponent gets the point. Note that it’s much harder to hit a true “side” lower than the edge, as you’d have to use sidespin to exit the side of the table and then curve back in to miss the side edge and hit the side below the edge. There is a serious problem calling serves “in” or “out” in doubles. I wonder if anyone has any ideas about this. This is what often happens: Server serves, ball lands either ON the line or 1, 2, or 3 cm INSIDE it (i.e. as much as, or even over, 1 inch), and the receiver calls “out”! With a bit of to and fro, usually a let can be obtained, but I think I am not the only one who finds this frustrating. 1. The ball is moving much faster across the receiver’s field of vision, so it’s physically harder for him/her to follow it. Try this yourself: hold out 2 fingers horizontally, and imagine the ball crossing the net, then landing in front of you. It moves several HAND-widths thru your f.o.v. BUT, if YOU hit a ball, between crossing the net and landing on the other side, it might only move a couple of fingers’ width thru your F.O.V. 2. The ball may have swerve on it, because of sidespin. The service may approach the receiver at some angle, and it may APPEAR to be heading for the “foul” side of the table -but the swerve brings it across the centre line at the last moment, and it lands in. The problem here is that expectation – prejudgement – can affect our perception – we get visual signals that the ball may be going to land on the wrong side, and we also WANT it to land out, so that’s what we “see”. First, if possible, players should walk through the mental and physical difficulties that any receiver faces when calling. Second – and this is IMO the best way to minimise the hassle of wrong calls – suggest that all 4 players actively watch the serve land. Call AGAINST your serving partner if you see the serve out. Ask the other players opinions: if there’s a clear 3 to 1 call – either “in” or “out”, go with that. If not, and if it was very close to the line, play a let. Beyond that, as a player trying to hit the ball, I am acutely aware HOW HARD it really is to WATCH the ball all the way until it hits my bat. If I MYSELF practice that, I know I will also reduce the difficulty of judging the serves I MYSELF am receiving. Yeah this jerk in my office tried to pass off Myth #2 as a real rule. Even though he forfeited that game, he still beat me 3 games to 2. What if the ball touches my finger during playing ??? Is it FOUL?? I’ve met older players who still think that the serve must be performed between the two side lines, that they can’t break the sidelines and serve from a wide angle. I wonder if that “rule” use to exist. What if you have multiple let serves in a row? Is their a limit by which the receiver gets a point? So if the server serves the ball and it hits the net and the ball lands in the receivers court it is a let. If this happens again immediately on the next serve, is it a point for the receiver? There’s no limit, so you can do it an infinite number of times. It’s not like tennis where you have double-faults. Yes, the rule concerning lets is just the same as tennis. Since table tennis has only 1 chance to serve and not 2 like tennis, the rules aren’t comparable. What will happen if the ball touches your hand while you areserving? Then the point is over, the opponent gets the point. Same as if it touches your jersey, or your body before contact with the racket. Not True, everything in your racquet hand till the wrist is the racquet area, as long as that hand is still holding the racquet. Sorry you’re correct. The playing hand counts. I’ve seen people serve with the back of their playing hand before, quite tricky! In singles leaves the receiver’s court after touching it by either of its sidelines. As addressed in an earlier comment, the 2.09.01.05.x rules apply only to those in wheelchairs. The pros don’t use these kinds of serves that often because the top players can take a serve like that and loop it around the net. But I use it occasionally as a surprise. This serve is actually one of the signature serves from He Zhi Wen and it’s a big part of his game. He likes moving his opponents to the wide angles to make them run around. If you read some of the other rules before that one you will see a couple that will convince you. Its a let if the ball comes to rest on the receivers end, bounces backwards towards the net after landing on the receivers end…. ect. Under the bit about wheelchairs, the following rules all refer to wheelchair play. In singles or doubles game, if a player serves the ball, it bounces once on server’s court and than on receiver’s court it just touches the side lines and goes off the track, will the server has to do the serve again (like we do re-serve when ball touches the net) or it’s a point. We also call it Lucky Point. That’s a legal point. The edge counts as part of the surface of the table. Nope, you can stand as far bas as you’d like. In doubles,while doing serve,the ball touches the net and bounced on the receiver’s left hand box.Is that a re-serve ,or the receiver gets the point? When you say it lands on the “left” side, is that the side it’s normally supposed to land on for a valid serve, or the wrong side? If it’s the correct side, then it’s a “let” and you re-serve. If it’s the wrong side, then it’s the other team’s point. This entry was posted on Wednesday, November 11th, 2009 at 1:01 pm	and is filed under Coaching, Tips. You can follow any responses to this entry through the RSS 2.0 feed. You can leave a response, or trackback from your own site.